By this calculating scheme in case you know the LED current and the supply voltage you can get the value of the limiting resistor, which you have to connect to the circuit to achieve the optimum operation mode of the diode (light intensity) and protection of the semiconductor crystal from damage. For even greater facilitation in the cases when you don’t know the voltage drop and the current of the diode, you can choose standard values ​​of this drop on the diode from the drop-down menu "Select standard values." If the calculated value of the resistor is not standard, the scheme recommends the closest standard values. 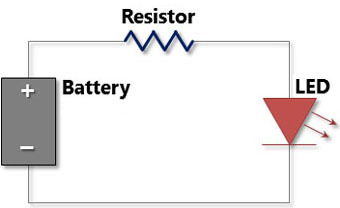 For example, if you have a DC power supply of 12 VDC and you have purchased a LED diode with rated current of 50 mA (If LED = 50mA) and voltage drop 1.2 Vdc (Vf = 1.2 Vdc) the calculated value of the resistance is 216 Ohm, but there isn’t such standard value therefore the closest suggested standard values ​​are 200 Ohm and 220 Ohm.